Across the road from the Governor’s office in the City of Jambi there is a very nice park that has a traditional home (Rumah Adat). The name of the park is “Taman Budaya Mayang Mengurai.” The park is named after the wife of Orang Kayo Hitam, Mayang Mengurai (alt. spelling Mayang Mangurai). According to Jambi legends, they are accredited for forming the Jambi Kingdom. 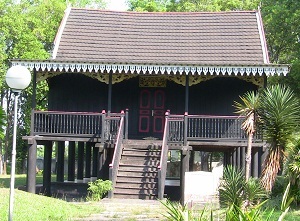 The location of Taman Budaya Mayang Mengurai can be found by clicking this link.